No business grows without the help and dedication of many people. Over the years, the contribution from our employees and their belief in our vision has a made profound impact on the growth of our business. Each person has brought his or her own unique qualities. Everyone has something to offer. Some people are organized and neat, some innovative and trend-setting, others are fussy and particular. Mark has assumed the role of Shipping & Packing Department Manager, and it is well deserved! He schedules hundreds of shipments to be packed and shipped and out the door on a daily basis. With his experience and innovative ideas Winfrey’s is running fast and efficient today. Mark also runs our Corporate Customers and Wholesale Business. Scott serves as our Production Manager. His engineering skill is also put to work by keeping all of Winfrey’s equipment in ship shape working order. Scott was born into Winfrey’s Fudge & Chocolate and he certainly has chocolate running through his veins. Always full of new ideas for products and production, Scott’s enthusiasm will continue to grow Winfrey’s and keep the family secrets! Manager of Store Operations, Marketing Manager and helping in the offices are a few of the things Jillian handles on a daily basis. The concept "Multitask" was created by Jillian! She is heavily involved with our Retail Division of the company. In her "spare time" she designs our point of purchase signage, our web site, our wholesale brochures, our retail mail order brochures, and plans all of Winfrey’s parties. All with one arm tied behind her back! Yes, this young lady is ready to take Winfrey’s to the next level. Melissa was our niece and our cousin and at Winfrey's, she was our friend, our shining light. Sweet Melissa, on loan to us from 1980 to 2005. On peritoneal dialysis at 3 months, first kidney transplant - MGH at 9 months, one of the world's youngest transplant patients, second transplant age 11, third kidney/liver transplant age 25. It was the life she knew. She accepted it. She never tried to challenge her world, she accepted it and happily. If she had to go back into dialysis... well that was the way it was. If she couldn't drink alcohol (or even too many liquids) on her 21st birthday... that was the way it was. She lived her life always with a smile. While people around her defined her approach to life as "strong", she defined it as "busy", when she had dialysis every other day and "fun" when she went to New Hampshire with the girls from the Rowley candy store, or dressed up like a witch on Halloween and "exciting" when she got engaged to Brad the love of her life and "incredible" when she thought of becoming aunt Melissa. She would always smile and say "Ya, I can do that" whenever I asked her to leave her desk and help wrap chocolate lollipops, or stand at the candy store register to give an extra hand during holiday sales, or put bows on our boxes of chocolates. No job was beneath her or above her. She lived smack dab in the middle of life. She lived every moment like she wouldn't see it again. She accepted every person for who they were without judgment. I am not making this up, honest! The world has a little less light without her but once she gets settled, I think she will be shining down brightly on all of us. I would like to thank one person from all of us who knew Lissy, Linda. For her courage and commitment for making all those difficult decisions for 25 years. Without them, we never would have known our sweet Melissa. Assistant Production Manager, Vinny is Scott's right-hand man. Has known the Winfrey’s since he was in 3rd grade. He played baseball and football with Mark & Scott Winfrey. In High School Vinny was a Tri-Captain of the Varsity Football Team with Mark & Scott. Theirs is a friendship people only hope to have! Now these three friends have teamed up to build Winfrey’s Fudge & Chocolates. 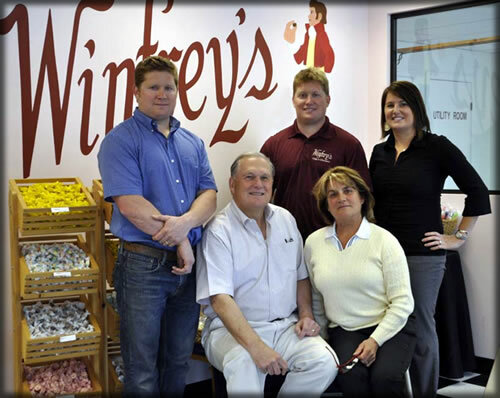 Vinny is a fine Candy Maker at Winfrey’s. Our head fudge production manager, has been with our company since 1981. He began after graduating from Peabody High School. David’s persistence and determination have helped him to achieve his production goals. In one day he has manufactured over 3000 pounds of our cream & butter fudge single-handed! David has grown up with our company and has built his own family of 5. Four strong sons and one beautiful daughter. The familiar voice you hear is Tricia's. She is head of the office department, taking orders and keeping everything running as smooth as possible. Do not move her cheese!! Tricia's exacting demands keep the office neat and tidy. She is always lending a helping hand – you may even see her out in the Retail Store during busy season! Retail Clerk Aficionado! Heads up our Rowley Store with her superior leadership. She has been with Winfrey’s since July of 2000 and has created an atmosphere of teamwork and responsibility. She has a straightforward simple manner that keeps everyone focused on customer service and quality presentations. 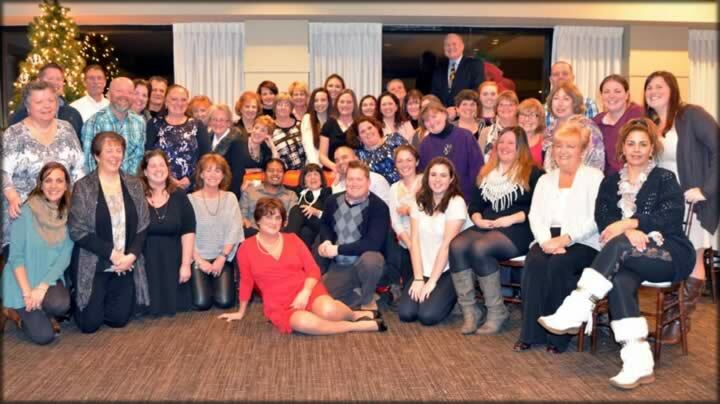 Michelle heads our busiest store in Stoneham, MA. She runs a tight ship and keeps the store running very smoothly! With an extensive background in management and as a mother of three, Michelle makes her job look easy! Delivers our fine confections all over New England. The classical music blaring from our new Sprinter Van can identify him; you might even see him at King Richards Faire playing an ol’fashioned recorder. Our Jack is always good for a story and an opinion. Has been with Winfreys since February 1996. The phone company reorganized and gave us their finest gem! Joanne has a creative eye and pleasant manner. She is efficient and effective in customer satisfaction. Winfrey's fine candy makers. What a staff we have here! You can see their smiling facing decorating chocolates, cooking a batch of caramel, or molding our festive chocolate lollipops. If it wasn’t for these people our shelves would be empty!